The past few days have witnessed a remarkable public interest in the symbolism of the 30th May Biafra Remembrance, particularly the 'Sit At Home' order. 30th May is just one day in 366 days but it represents an enduring epitaph that recalls many great feats, struggles and tribulations. It is about the greatest collective self-defense against a genocide that lasted four years from 1966 to 1970. 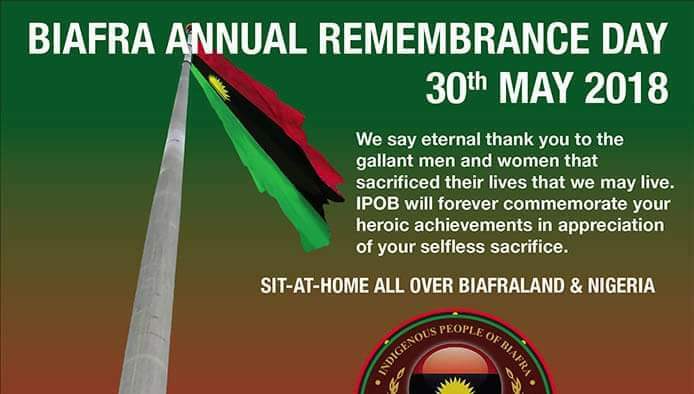 It is also about saluting the supreme sacrifice of all Biafrans who have formed the only bulwark against the renewed vigor of hatred of Biafrans that has resurged since 30th May, 2015. Many have died resisting, many have been maimed, many have been traumatized; but for all of us who continue to survive, the only thing that makes us human, gives us honor and succor is to 'Sit At Hone' and remember. It is about remembering Mazi Ugo Ukandu who, in 1967, separated from his two fleeing brothers in Kaduna and faced down his pursuers. According to the eyewitness account of an American missionary, "Ukandu separated from his brothers and ran headlong into the wild crowd surging towards him. And in a twinkle, he disarmed the first one that lunged at him with a cudgel. With that cudgel, Ukandu was able to fatally mow down at least 20 of his assailants before their sheer numbers overwhelmed him. His courage and strength was a sight to behold and remember forever". Sitting at home on 30th May is but one small act of remembrance. To every Biafran, this little-known Mazi Ukandu should be the very first Biafran soldier. He took the first stand, he took on the evil right at its territory. And like the rest of the Biafran soldiers after him, he was unprepared, yet much emboldened by the extreme necessity to defend himself. 'General' Ukandu, we salute you today. We will sit at home to remember you. You didn't die in vain. It is to the many Ukandus and other soldiers of the trenches that our thoughts will inevitably turn to on this 30th May. Yet we must not forget that the attritional battle in the trenches were just part of a vast war effort by men and women from across Biafraland. It was a war fought over a sprawling canvas, both on land, sea and air, but most importantly, it was a psychological war of wills; and which in the end saw the greater will triumph. That will is one of saying "we will not stand by and allow you to match to our homes and slaughter us like you slaughtered us in your territory". That we endured for all the three years. 30th May remembrance is about celebrating that triumph of the indomitable Biafran spirit. But 30th May does not just remind us of the sacrifice of the soldiers, sailors and airmen of the great Biafran resistance of 1967 - 1970, but also of those who followed them in later conflicts – those who, in this era, stepped out to the streets of Igweocha, Onitsha, Aba, etc to protest the resurgence of evil, those who were murdered at the night vigil in Aba, those who were mowed down at Nkpor, and those who, more recently, lost their precious young lives at various locations in Biafraland, including at Afara-Ukwu, Umuahia. Particularly with this years 'Sit At Home', as we rue our fate as a people and remember those who have died in the course of freedom, we must think of those they left behind - their families and their friends. We must also remember those that are missing since 2015, those in illegal detentions, and those that have stepped forward to speak out, to lead; and despite the great dangers ahead, have stayed the course. Through the 'Sit At Home, we come to appreciate that those soldiers of 1967 -1970 and our fallen self-determination agitators of today were not just fighting for themselves alone, they were fighting for our freedom and our future. 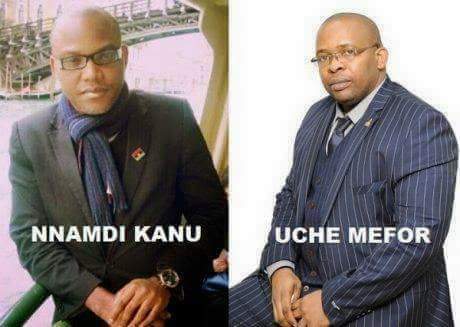 It is a sacrifice that connects all our Biafran peoples - past, present and future. So on this 30th May, as we come together as a people, either sitting at home or conducting other sincere acts of remembrance, let there be pride for the service, as well as sorrow for the sacrifice.